Tuesday in Love - Water Permeable Nail Polish - Legit or not? Halal Nail Polishes are a rave these days. Some question the halal-ness and others wonder why do we even need one. I am one of the latter, but these are all personal, subjective point of views so please no offense. I am a do or don't person and never look for grey areas but for many these grey areas provide assurance of a certain kind. The Halal nail polish is one of those grey area situations. How authentic and reliable are these? Even though tested thoroughly many are reluctant to try them. I happened to try one of these Halal / Wazoo friendly, water permeable nail polish brand and discovered something interesting. I was recently asked to test water permeable nail colors by Tuesday In Love, a Canadian Cosmetics company. "A revolutionary polymer that allows water molecules to penetrate through micro pores. Easy to peel and remove without the use of harsh chemicals or nail polish remover. Does not contain any formaldehyde, toluene, dibutyl phthalate (DBP), or camphor. Not Tested on Animals." - Rich in Color - Compared to Inglot which looked like water color on my nails, Tuesday in love colors are rich and one coat is good to go. - Short time wearability - They start fading and peeling after a good 5 to 6 hours like most water permeable nail colors. Unfortunately these samples were given to me for Testing & Review. Its not easily available in Pakistan but can be ordered Online through the Facebook vendors or elsewhere. You can check their website as well for more details. I love the hues and vibrancy. I tried Inglot in Malaysia and it was like painting my nails with water colors :/ Didnt like them one bit! i dont mind the concept with it being free of many icky chemicals n all n then no need for stinky removers but whoa the price is steep! Amazing review! Love your blog! Thank you for your review Maliha! 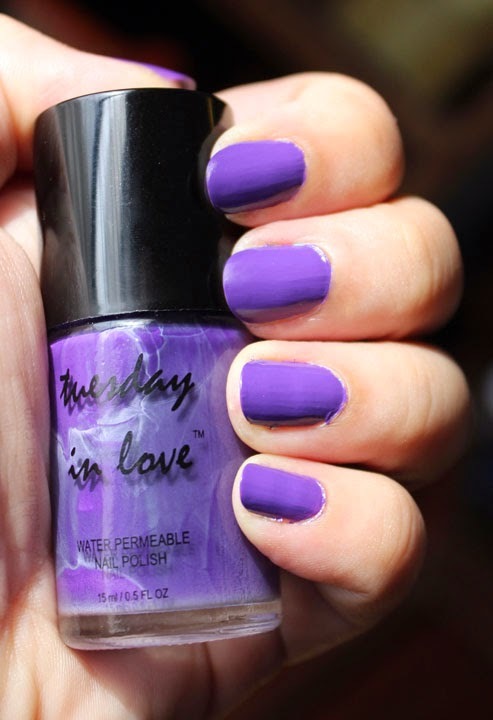 How do you compare Tuesday in Love to MAYA nail polish?